Super high capacity, long run time, external universal battery pack that can provides 15V or 19V DC power for laptop notebook computers, medical equipments and other electronic devices. Made with high quality Panasonic Li-ion battery cells. Size: 10.6" x 5.7" x 1.3"
19+ popular interchangeable connectors. We may discontinue some old tips and add some new tips according to the market without notice. Actual connector tips come with the battery may not be exactly same as the pictures show. 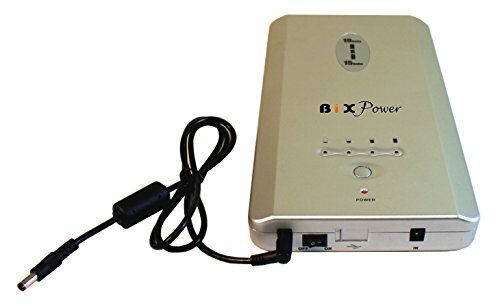 More optional connectors are available from BiXPower. This battery may triple your computer running time. It may add 9 ~ 18 hours extra running time for most laptop/notebook computers and 20 ~ 30 hours extra running time for most ultra-books and tablets. This battery can work together with a device's internal batteries. Most laptop computers' internal battery capacity is around 50Wh to 75 Wh, but this battery capacity is 223 Watt-hour (Wh), or 60300mAh if rated like many other brand external batteries on market. Made with high quality Panasonic Li-ion battery cells. UL / IEC 62133 Certificated ( in Oct. 2016). Compact size can easily fit into a laptop/notebook carry bag. Travel by air: Please contact with your airlines to check whether this 223 Watt-hour capacity lithium ion rechargeable battery is allowed to be carried on airplane before traveling with this battery pack. Comes with an AC charger and a Car charger. AC charger can charge the battery from 100V ~ 240V AC power outlets. Car charger can charge the battery from a car cigarette lighter socket. Compatible with many devices that need 14V, 14.5V, 16V, 16.5V or 18V, 18.5V, 19V, 19.5V or 20V DC power. Works for most laptop notebook netbook tablet computers, such as Acer, Asus, Compaq, Dell, IBM, HP, Lenovo, Samsung, Sony, Toshiba laptop notebook computers and tablets, medical equipment and other electronic devices. 5V USB port provide power for iPad, cellular phone, MP3 player or other small electronics that can be charged from a 5V USB port. 19 + popular interchangeable connecto tips work for many popular brand laptops and other electronic devices. More optional connectors are available for purchaing seperately from BiXPower. Actual connector tips come with the battery may not be exactly same as listed here.